Trump Tests Midterm Message On Immigration, MS-13 'Animals' During Tenn. Rally The president was campaigning for GOP Rep. Marsha Blackburn, who finds herself in a close Senate race with former Democratic Gov. Phil Bredesen pivotal to Senate control. President Trump speaks during a rally in Nashville, Tenn., on Tuesday. "I've never heard of this guy — who is he?" Trump chided Bredesen. "He's an absolute tool of Chuck Schumer, and of course the MS-13 lover Nancy Pelosi." It was a new moniker for the House minority leader, and Trump doubled down on controversial comments he'd made earlier this month about the drug gang. Trump did touch briefly on other issues that Republicans want to be a focus of their midterm messaging, such as the GOP's tax cuts and the economy, but it was immigration that was the overarching focus of his speech. Meanwhile, congressional leaders have been working to avoid a fight on immigration as moderates have been pushing for action on the Deferred Actions for Childhood Arrivals (DACA) program. Trump defended his hardline immigration rhetoric, central to his 2016 campaign, as an asset for the midterms. "And you can say what you want, but I think border security and security in general is a great issue for the Republican Party," Trump said. "I think it's a great issue, not a bad issue." The White House has repeatedly highlighted victims of gang violence as evidence that the U.S. needs more stringent immigration laws, including rolling back some forms of legal immigration. Critics, however, say the administration is simply exploiting such tragedies for political gain and to disparage Hispanic immigrants. It's a campaign tactic that GOP gubernatorial nominee Ed Gillespie tried in last year's Virginia elections — and lost handily. 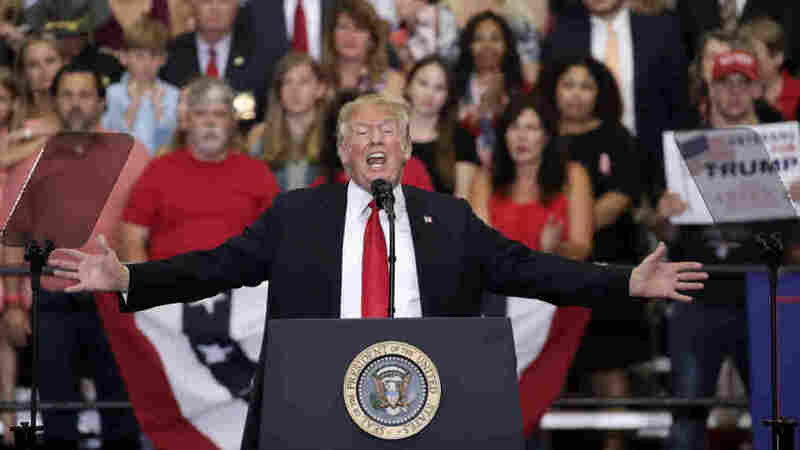 But Trump ramped up his original rhetoric on immigration and MS-13 on Thursday night, nonetheless, even returning to some of his tried and true favorites from the presidential campaign trail. On his prized southern U.S. border wall — which he's struggled to get congressional funding for — Trump promised the crowd that "in the end Mexico's gonna pay for the wall," implying it would be done via renegotiating the North American Free Trade Agreement (NAFTA). "They're gonna pay for the wall, and they're going to enjoy it," the president went on to claim. Mexican President Enrique Peña Nieto, however, had a very different response later via Twitter. Trump carried Tennessee in 2016 by 26 points, so his efforts on behalf of Blackburn can greatly buoy her in the state against Bredesen, a popular former two-term governor who was easily re-elected last in 2006. Trump was largely on message Tuesday night, not even veering off to talk about the news of the day — ABC's cancellation of Roseanne after its star Roseanne Barr went on a racist Twitter rant. Earlier this year, the president had called the comedian, whose character was a Trump supporter, to congratulate her on its ratings dominance. Instead, Trump did try to tie "Phil Whatever-The-Hell-His-Name-Is," — who's tried to campaign on bipartisanship and pragmatism — to the national Democratic Party as a whole. "If Bredesen were ever to get elected, he would do whatever Chuck and Nancy" want, Trump said. "They don't want the wall, they want open borders, they're more interested in taking care of criminals than they are of taking care of you — Bredesen donated a lot of money to the campaigns of Barack Obama and Hillary Clinton." "Crooked Hillary!" Trump added gleefully, as the crowd predictably returned to the routine campaign trail chant of "Lock her up! Lock her up!" The full-throated endorsement of Blackburn was important for her, as she struggled early on to unify some of the state GOP behind her in her quest to succeed retiring Sen. Bob Corker, who briefly flirted with reversing his decision not to seek re-election. However, the sometimes Trump critic would have likely lost to Blackburn in the primary. After saying he wouldn't run, in a CNN interview Corker made glowing remarks about Bredesen but only muted, general comments about Blackburn without using her name. Blackburn has long been a vocal Trump backer, and in brief remarks to the crowd she promised she'd be a stalwart ally for the president if elected. "Tennessee needs a senator who is going to support President Donald Trump and I am going to be there to stand with President Donald Trump to take your Tennessee values to Washington, D.C.," Blackburn pledged. Corker has tried to mend fences with Trump after the Senate Foreign Relations Committee chairman questioned the president's fitness for office and diplomatic approaches last year. While Corker and the state's senior senator, Lamar Alexander, were in attendance Tuesday night, the very pro-Trump crowd wasn't shy in expressing their displeasure. When Trump ticked off Corker's name while listing other GOP officials, attendees loudly booed.